Lecture series are generally organized each season and are announced to the interested public and Forum members through flyers/announcement posters and the Forum web site. 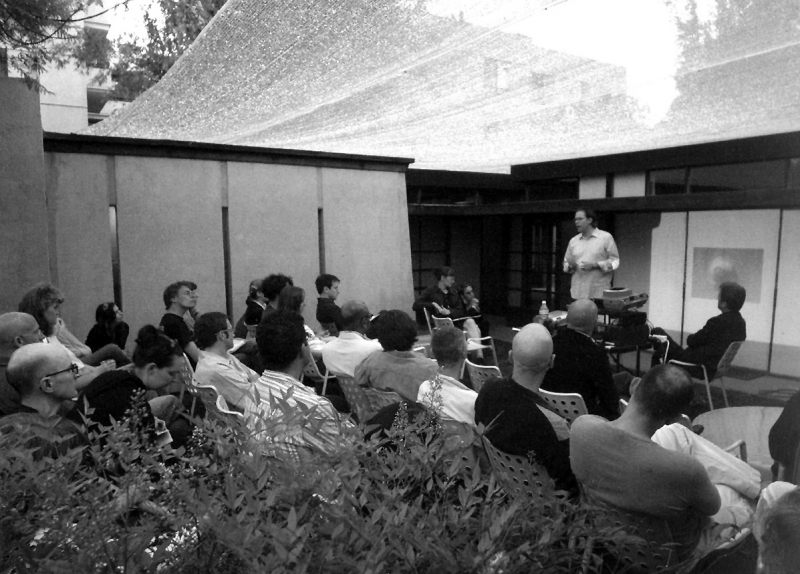 Historically, the majority of the lectures have been held on the back lawn of the MAK Center for Art and Architecture at the Schindler House on Kings Road in West Hollywood, where we still host our Fall lecture series. Current lecture venues include the Woodbury Hollywood gallery space on Hollywood Boulevard, where we host LA Forum Events @ WUHO. Admission is free to members while non-members pay a nominal fee. The Forum’s past lecture series include Moving Targets, Fake Estate, Natural Productions, Out There Doing It, and Slippery When Wet. The rest discussion series, “Moving Targets,” in Spring 1987, brought together architects and urban theorists including, Craig Hodgetts, Robert Mangurian, Mario Gandelsonas and Richard Weinstein, as well as artist John Baldessari. “The Body Series,” four discussions on the relationship between our bodies and the body of architecture, the Forum’s second series, was held during the Summer of 1988. Events included slide lectures, a visit to Gold’s Gym and a performance piece. The third and most popular series, “Out There Doing It,” was held in three parts over the course of two years. Informal presentations were made by emerging design practitioners based in Los Angeles (for some rms this was their rst talk before the public). The Spring 1989 part included: Franklin D. Israel, Aks Runo, Central Of ce of Architecture, Johnson/Favaro, Michele Saee, Ron McCoy, Norman Millar, Neil Denari, and Holt Hinshaw Pfau & Jones. For the Summer 1989 portion, speakers included: John Lautner, Michael Burch, O’Herlihy + Warner, Guthrie + Buresh, Lubowicki Lanier, Janek Bielski, Christian Hubert, Josh Schweitzer, and Charles and Elizabeth Lee. Finally, for the third part in Spring 1990, the Forum invited: Hodgetts & Fung Design Associates, Koenig-Eisenberg Architects, Gary Paige, Wagner + Webb, David Kellen, Blake + Au, RAW Architecture, Chris Genik, and Victoria Casasco. For “Los Angeles Talks,” a series presented in Summer 1990, speakers took a more historical or theoretical approach. Douglas Suisman spoke on “Los Angeles Boulevard: Myths and Metaphors,” while Diane Favro presented a paper on “A Life in Architecture: Women Architects of Early Los Angeles”. Aaron Betsky, titled his talk “The Third Scene.” Urban theorist Mike Davis addressed “Fortress L.A.: The Militarization of Space,” and Alan Hess presented excerpts from his forthcoming book in a talk titled, “Travels in Hyperreality”. In the Fall of 1990, the Forum investigated major developments such as Playa Vista, Central City West and Universal City by bringing together all the major players, including: developers Maguire Thomas Partners, Inc., and MCA Development Company; politicians Ruth Galanter and John Ferraro; architects/planners Stefanos Polyzoides, Buzz Yudell, Bill Fain, and John Jerde; neighborhood representatives; writers; and housing advocates to discuss the implications of these projects. Each event was held at the development site. The annual “Out There Doing It” lecture series of Summer 1998 again gave young architects and designers the opportunity to show their work and discuss its trajectories. Participants included Bryan Cantley, Annie Chu, RenÈe Cossutta, Mark Dillon, Dennis Hollingsworth, Mike Ishler, Adam Leventhal, Cameron McNall, Jennifer Siegal, and Gerard Smulevich. “TerrAtories of Engagement,” a lecture series held in Spring 1999, examined the complex relationship between architecture, landscape, and public art. Participants came from a wide range of practices and showed work that blurs the boundaries between these disparate disciplines. Elizabeth Bryant, Eugenia Butler, Carl Cheng, Laura Cooper, Peter Erskine, Jud Fine, Jacci Den Hartog, Doug Hollis, David Luce, Barbara McCarren, Anna Murch, Janet Sager, Achva Stein, and Richard Turner participated. The 1999 “Out There Doing It” series featured many collaborative teams as well as individual practitioners. They included Michael Blatt, Peter Borrego, Antony Coscia, Chava Danielson, Johnathen Day, Frank Escher, Michelle Fornabi, Alice Fung, Peter Grueneisen, Ravi Gunewardena, Eric Haas, Jason King, Nicholas Lowie, Sheridan Lowrey, Randall Stout, and George Yu. “Booktalk,” held in Spring 2000, featured LA writers talking about new publications on various subjects relating to Architecture and Urbanism. Participants included Mary Ann Ray and Robert Mangurian, Peter Zellner, Peter Lunenfeld, Margaret Crawford, John Chase, John Kaliski, Dave Hull sh Bailey and Jack Burnett-Stuart.